18 « September « 2013 « Nothing in Biology Makes Sense! Your dinner or your life: What determines the sprint speed of gazelles, zebras, giraffes … and ostriches? In the evolutionary history of big herbivores and the carnivores that prey upon them, the phrase “arms race” is only technically a metaphor. Antelope and zebras are literally born to run, and many of the things that chase them, like wild dogs or cheetahs, are either masters of endurance or champion sprinters. The evolutionary story almost writes itself: over millions of years of chasing, and being chased, whenever the predators evolved to become faster, the prey were selected to run even faster—until a cat evolves that can go from 0 to 60 faster than my Volkswagen Rabbit. Except of course there’s more to life than running for your life. 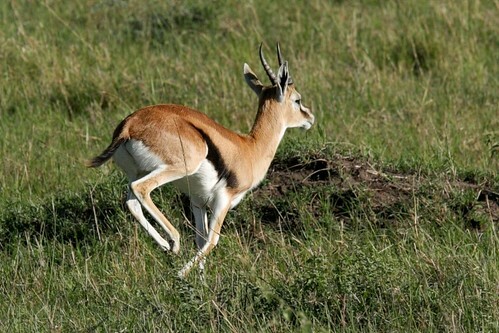 An antelope’s frame is under more demands than evading cheetahs—it also needs to travel long distances to follow food availability with the shifting rainy season. In fact, the North American fossil record suggests that big herbivores on that continent evolved long legs for distance running millions of years before there were predators able to chase after them. And then again, not all predators run their prey down; lions, for instance, prefer to pounce from ambush. In a paper recently released online ahead of print in the journal Evolution, Jakob Bro-Jørgensen sets out to disentangle exactly these competing explanations.